Separate the legs from the whole quail, debone paying attention not to damage the skin which will afterwards be separated from the pulp. Mince the pulp, season it with the white wine, salt and freshly ground pepper and a part of the chopped samphire. Stuff the skin with the mixture forming the shape of a leg and then roll it up in a tenderised slice of lard. Separate the back part of the quail, use it for the juices and put to a side. Insert the breasts and the obtained bones in a glass jar with butter, samphire, garlic, seal hermetically and cook at 52° C for circa 18 hours. Extract the quails from the jar, paying attention when separating the breasts from the bones. Brown the breasts on the skin side together with the stuffed legs in a pan with some extra virgin olive oil, until you obtain the right colour. Put the garlic and salt in a mortar and start to grind. Then add the other ingredients and continue to grind until you obtain a smooth mixture. Brown the hot pepper with the garlic clove that you will eliminate once browned lightly in a pan with some extra virgin olive oil. Add the chards and sauté for a few seconds. Season with salt and pepper and put to a side. Place the chards at the base of the plate, lay the quail breast on top, and then the leg and pour over a small quantity of the quail juices. 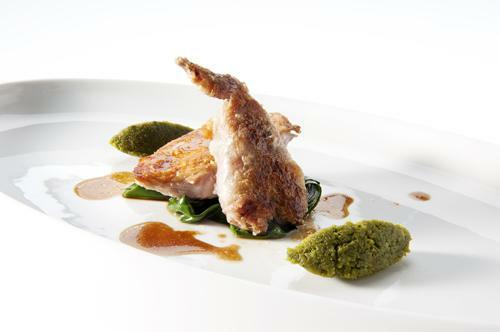 Garnish with three small quenelles of pesto and a few drops of anchovies “colatura”.